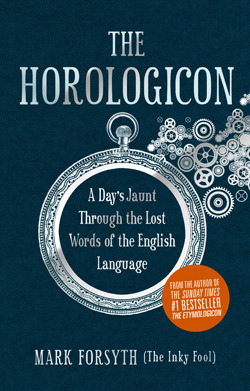 I recently finished reading “The Horologicon: A Day’s Jaunt Through The Lost Words Of The English Language” by Mark Forsyth. I love learning about the English Language, and this book shows so many different words which have been lost over time. The book is set out like a normal day, starting with dawn and waking up, going through all the daily events such as meals, working, shopping, then ending with evenings out and going to sleep. For each action you take through the day, there is a lost word which has fallen out of use. For some of them you can see the reason why they’ve not so popular, while others make perfect sense but were still dropped in favour of the current word. There are many fascinating words in this book, and many of them explain how the words which we know and use today evolved. What is pretty amazing is just how many words and phrases there are for “being drunk”! There is an Appendix with about 3 pages devoted to these words! A few examples you may not know included: “[he] has been catching the cat“, “[he’s] chickenny“, “[he] has frozen his mouth“, “[he’s] an indirect man“, “the King is his cousin“, and “it is star light with him“! Note: the next book by Forsyth is already available and is called “The Elements of Eloquence: How to Turn the Perfect English Phrase”. I have just finished reading “When The Earth Died” by Karl Mannheim. 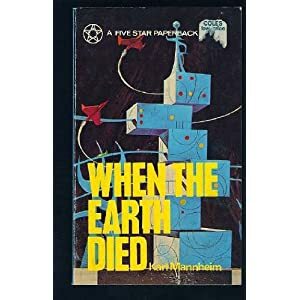 I bought this book in a second hand bookshop last summer while on holiday in Devon, and it attracted me because it is a science fiction title covering the possibility of the Earth dying while humans are still around. The book focuses mainly on a man called Barry, who has escaped the clutches of the Empire Police and their brainwashing ways, and suddenly finds himself a vital part of a secret mission to escape Earth and the increasingly dangerous war happening between two great empires. He and the girl he seems to love end up part of a mixed crew of scientists and other hand-picked normal people, ready to form a new colony on the Moon and beyond. There is a great deal of tension built up within the novel, with certain characters seeming to lose the plot and go a bit crazy, the suspect characters who turn out to be traitors, and those who seem to struggle with what’s right and wrong. There are a few minor characters, like the would-be colonists in the crew who we find out very little about, even though they are part of this special mission. The main tension is that of the journey in the spaceship, which takes them to the Mood and other places, which is a very dangerous journey into the unknown, and the death of the Earth which seems to happen surprisingly quickly! Maybe a little bit unbelievable! The fact that it is the humans who destroy the planet is pretty scary! The ending is as happy as it can be, given the circumstances of the novel! I give it 7/10 because it seems original, if a little bit too short of get into great detail about everything. Worth a read if you fancy a different apocalyptic and post-apocalyptic type story! Note: This book doesn’t seem to be in print any more, but is available online through Amazon and other online stores, and secondhand shops. My copy was published in 1972 and is a Five Star Paperback.